I focus on a lot of email scams, but there are still plenty of scams run by mail and phone. 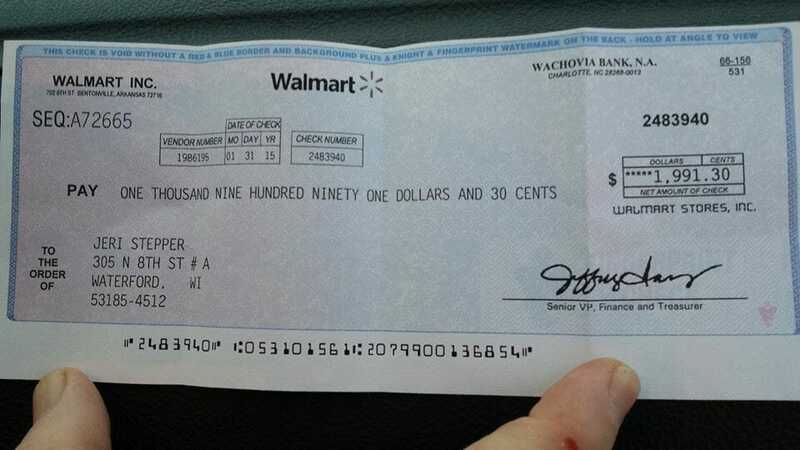 The Walmart check scam is labor intensive for fraudsters, but can be very lucrative. Jeri Lindsey warned all of her friends on Facebook about the scam when she barely avoided it. Jeri went on to add that once the check was deposited, it would find its way to the scammer, who would then pull the bank account information for the account where the check had been deposited. Well said, Jeri. The Walmart check scam is a classic example of how the scammer gets most of the information he needs from one location, then pulls different information after the victim has taken an initial step. You can help spread the word. Here’s a tweet ready to go. Walmart also notes on their website that they will never mail a check and ask you to buy something, then keep the remainder of the check as payment for services rendered. This type of Walmart check scam is another form of the classic mystery shopper scam that can eventually let the bad guys gain access to your banking information. Be wary if the bank says it looks legitimate. This sounds big enough that law enforcement would be interested. Consider contacting your local PD or the FBI. We received a check via fed x that didn’t require a “shopper” status. Is this also a scam? There was no coorespondance with it. Sounds like one to me, Karen. Call FedX and ask before you do anything with that check. I received one of those checks today, It looks legitimate, written on a Union Bank blank of San Francisco from an escrow co. No prior phone call, letter, or email. I’ve never had anyone just hand me $995 There are too many red flags in the body of the letter. No Company letter head, don’t inform anyone of what your doing (several times) not asking for a day and time that you are to make your visit, don’t follow any other instructions, send your “Walmart mystery shopping” results to 2 different emails, Checkwalmart@aol.com & Checkwalmart@outlook.com, and telling you it’s your first assignment and you’re being judged for future assignments with a possible raise. These are the instructions from partner “A” the letter received with the check. Here is what happens. You cash the check, and head for your first Walmart. In the mean time, payment is stopped on that check or it has insufficient funds or no account, So what you thought was your commission and Walmart purchases, along with the remainder of the check you received, and was sent to partner “B” is NON EXISTENT-GONE. Whatever you bought or wrote checks for, or sent as a Money Gram or a Western Union money order is out of YOUR POCKET. I’m keeping the check (not cashing it). I’ve been taken once on a similar scam. If you would like names, I have several..
I’m not an attorney, Tami, but you are in receipt of money that is not yours. The liquor store made a huge mistake by cashing the check, but their mistake doesn’t let you off the hook if they decide to pursue this. Depending upon how long it’s been since you cashed the check, they may not yet realize they, too, have been victimized. The last thing you want to have happen is for this to go to court, so if you have a legal resource (perhaps check for a local Legal Aid Society?) it could be a good time to be proactive. Best of luck, you’re in a tough spot. Yes they can and probably will. If you’re lucky you won’t be prosecuted for bad check fraud and they will just get a judgement against you for the amount of the check plus a bad check fee and interest. If they do get a judgement you are entitled to sue the issuer of the check but good luck finding them let alone their being accessible for a small claims suit. You might as well assume you will not get anything from the scammers, nor should you really since you didn’t enter into a contract nor do any work for them. I’m not saying it’s your fault necessarily but remember that there’s no free lunch, companies don’t just mail out checks so you can have a free trip to the liquor store. Unless you want to drag this out for years at great cost and hassle to you from collection agency calls, get ahead of it and with the first notice that it was bad, ask for them to make a settlement offer. If they will not, make a payment plan. Start saving NOW to get rid of this if you don’t have the funds available yet.